A double retrograde with moon phase, powered by an in-house movement. Available in three different guises, the Maurice Lacroix Masterpiece Moon Retrograde unveiled at Baselworld 2017 offers a retrograde displays of the date as well as power reserve, equipped with a proprietary movement. With the twin retrograde indicators, Maurice Lacroix pays tribute to the original Masterpiece wristwatch introduced in 2003. Hours and minutes are displayed traditionally via the central hands while the calendar function at 10 o’clock and the power reserve at two. Additionally, the watch displays the day of the week on the same sub-dial as the moon phase. 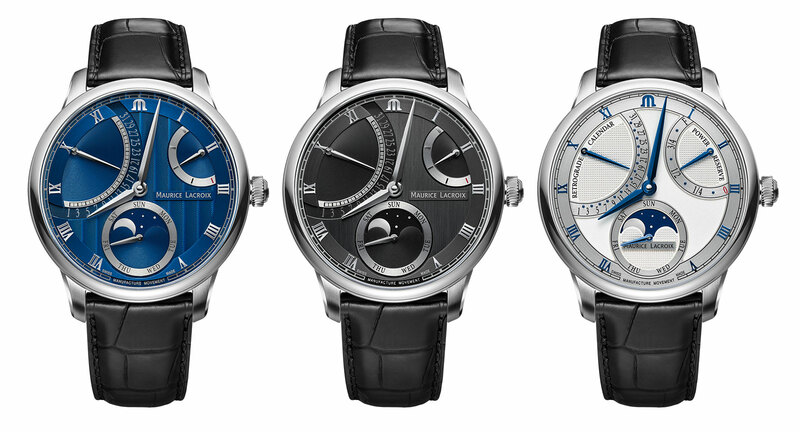 The Masterpiece Moon Retrograde is available with a blue, black or silver dial. 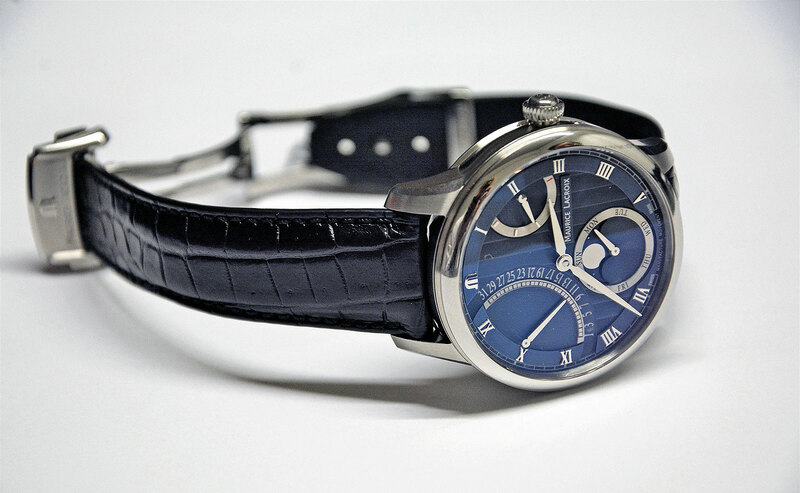 Both the blue and black dials have rhodium-plated indices and hands, but different dial finishes. 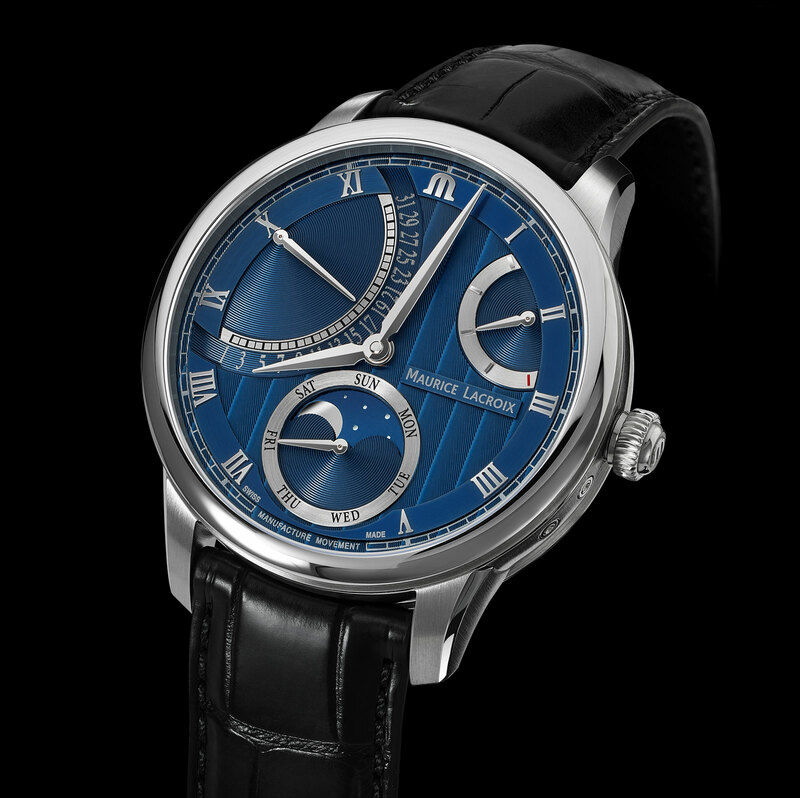 The black dial has a vertical brushing while the blue version is finished with Côtes de Genève, the same decoration often found on movement bridges. The third colour option is a silver dial with blue hands and indices, matched with a Clous de Paris, or hobnail, pattern on the three sub-dials for the calendar, power reserve and moon phase. As the retrograde display for the power reserve on the silver dial version is a little bigger, the power reserve indicators on the other two references are comparatively smaller, explaining the different position of the brand name on the dial. The Moon Retrograde features a polished stainless steel case with a diameter of 43mm. Despite this quite large diameter and an impressive height of the case, the piece sits on the wrist very comfortably, thanks to the relatively short lugs. A see-through case back enables the beholder a view into the self-winding ML192 movement, which is an in-house calibre that contains 344 parts. It runs at 18,000 beats per hour and has a power reserve of approximately 52. 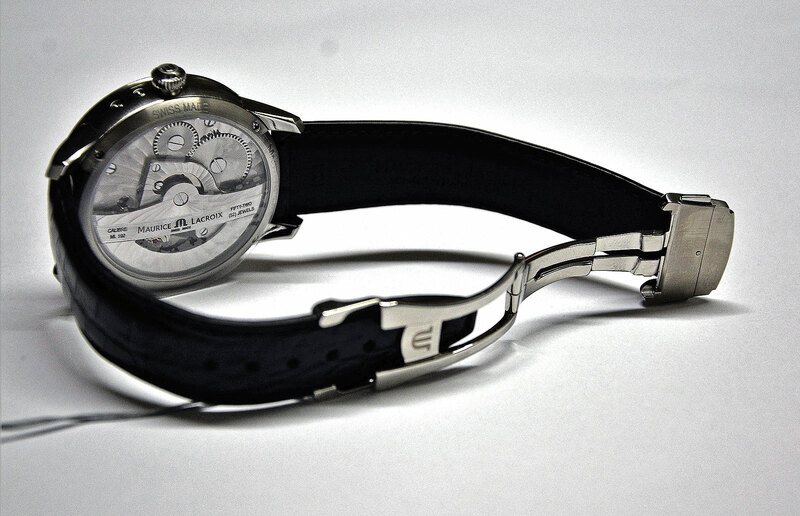 The rhodium-plated bridges and the skeleton rotor are decorated with spiral Côtes de Genève. 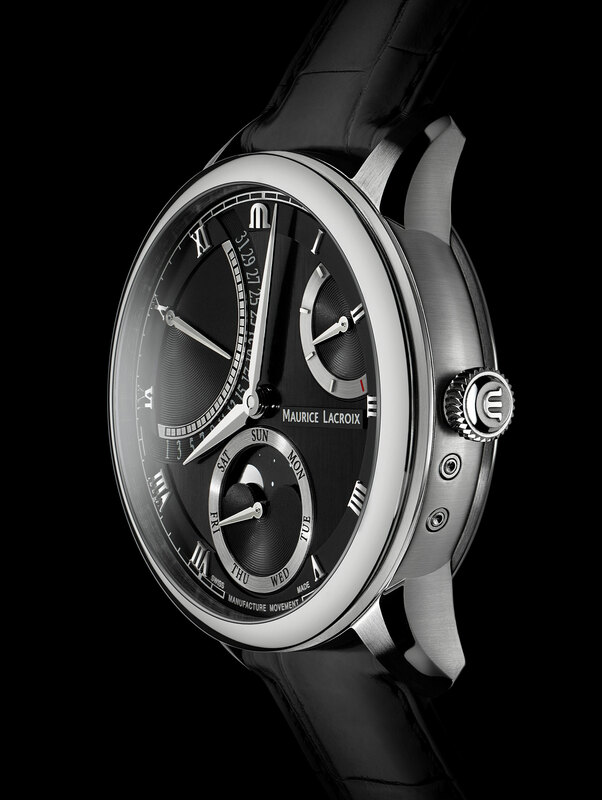 The Maurice Lacroix Masterpiece Moon Retrograde is fitted to a black crocodile strap with a folding buckle. The retail price is be SFr4900. Maurice Lacroix gives its "Super Compressor" style dive watch blue and yellow livery in a 100-piece limited edition.